Harvard cognitive scientist Stephen M. Kosslyn, who studies how brains process images, wants to improve the world with his cutting-edge research. 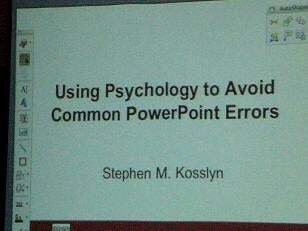 And he's starting with four ways to make your PowerPoint presentations more human brain-compliant. This morning at the American Association for the Advancement of Science annual meeting in Boston, Kosslyn spoke in a symposium devoted the visualization of data, explaining how breakthroughs in cognitive science have revealed the best way to present information in the PowerPoint format. It was one of the most interesting examples of applied science I've ever seen. The Rudolph Rule refers to simple ways you can make information stand out and guide your audience to important details — the way Rudolph the reindeer's red nose stood out from the other reindeers' and led them. If you're presenting a piece of relevant data in a list, why not make the data of interest a different color from the list? Or circle it in red? "The human brain is a difference detector," Kosslyn noted. The eye is immediately drawn to any object that looks different in an image, whether that's due to color, size, or separation from a group. He showed us a pizza with one piece pulled out slightly, noting that our eyes would immediately go to the piece that was pulled out (which was true). Even small differences guide your audience to what's important. The Rule of Four is a simple but powerful tool that grows out of the fact that the brain can generally hold only four pieces of visual information simultaneously. So don't ever present your audience with more than four things at once. This is a really important piece of information for people who tend to pack their PowerPoint slides with dense reams of data. Never give more than four pieces of information at once. It's not that people can't think beyond four ideas — it's that when we take in the visual information on a slide we start to get overwhelmed when we reach four items.